We don’t have to live with the same old assumptions. I have been a little perplexed at a couple of responses to one of my blog posts over the weekend which seemed to miss points that were either explicit in the post or well established in the literature. The post explicitly states that all students within the normal range of intelligence can be taught to read. It implies that children with significantly low intelligence may not learn to read. 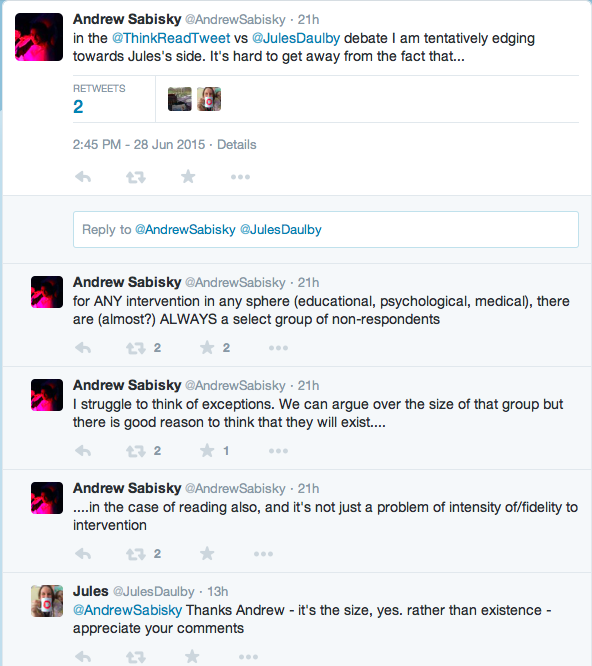 @AndrewSabisky‘s comment is therefore an acceptance of what the post already states. It does not detract from the argument. It is also worth noting that ‘within the normal range’ includes those with a so-called discrepancy between IQ and reading achievement. More on this below. The blog asserts that, for students within the normal range, all can expect to read accurately. Using Thinking Reading as an example, I point out that all the students in the programme over a six-year period progressed to read at their chronological age. For the sake of clarity, this did not mean that they all had the same lessons, but rather that each student’s programme was adjusted depending on their response to the intervention. A key point to bear in mind here is that I am not referring to an academic study carried out over a fixed term. I am talking about teaching students until they are reading as well as they should, whether that takes two months or twelve months. There is a big difference. The assumption is that some students must fail is exactly the kind of limiting expectation I am challenging. The post points out that the reason interventions are designed is in order to meet the needs of those for whom other approaches have not worked. A good intervention will have the capacity for response to the individual student built in. 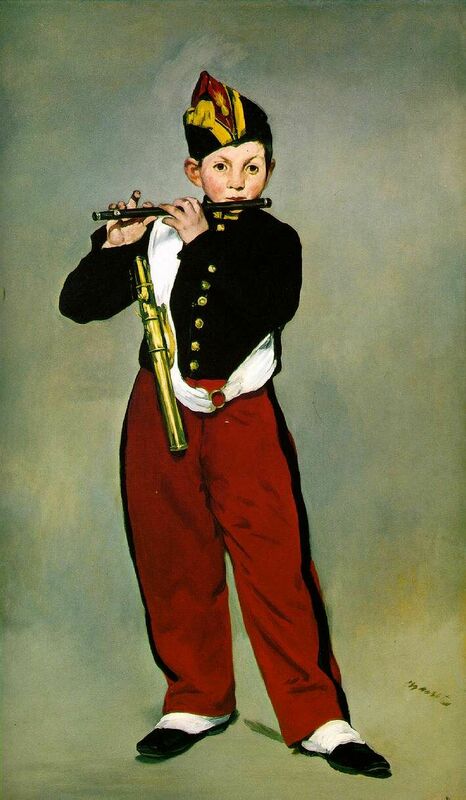 In this sense, fidelity to the response contingencies of the intervention is the crucial factor. If you have to wait until the end of the intervention before you act on the data, it’s not a very responsive intervention, and will therefore, inevitably, fail some students. See, for example, the Response To Intervention model which specifically plans to collect monitoring data and make adjustments for students during interventions, in addition to providing interventions of increasing intensity. Julian Elliot has written extensively about the use of a dyslexia label being counter-productive. The emotional, social and political functions of this label exist, but they do not actually enhance the learning of those to whom it is applied. In particular, Elliot points out that the folkloric definition of discrepant IQ has no evidence in the literature. Stanovich rejects this notion as well. As Susan Godsland’s website shows, it has, in fact, been discredited for some time, yet here it is being recycled. Assistive technologies may be entirely appropriate in some circumstances, particularly compensating for physical disabilities. Despite a long-standing enthusiasm for ‘processing disorders’ in education, there is no evidence that such ‘assistive technologies’ improve reading (Hempenstall, 2013). They should never be a substitute for explicit systematic teaching of reading – except where they are adaptations to overcome a motor disability. As for the comment that “my students will never hear the term dysteachia” – why would they? What possible reason could there be? As Zig Engelmann makes clear, it is a term coined to remind teachers that the onus is on us – to teach effectively. Sometimes a lack of evidence in ‘the literature’ is not the same as something not happening in the real world. Science is not an ‘exact’ subject, it is one that is about questioning and looking for answers. I can think of two specific examples of people I know who very clearly have a high level of intelligence (for instance, one of them is a hospital consultant), but a specific difficulty with reading/writing/spelling that is puzzling given their clear linguistic and intellectual abilities. This doesn’t mean that they can’t read/write/spell, just that they found it considerably more difficult to learn to do so than other people, because their brains didn’t seem to work in the same way. People can find a diagnosis of dyslexia reassuring, as an answer to a puzzle that concerns them, and also useful in that they can be given more support, and more time to complete written exams. I’m not really clear why you link a diagnosis of SEN, with an implication that we just give up on a child. I’ve never met a single teacher who viewed SEN in that way. Rather, teachers see it as a way to come up with more appropriate strategies to use with that child, and to gain the additional support that the child might need. I’m not clear who you think ‘wins’ if we say that SEND is only about specific physical difficulties/disabilities, i.e. the ‘D’ of SEND. I’m also not clear why a disability or difficulty cannot be something in a person’s brain, as well as in a person’s body, unless I’m confused and that is not what you are driving at? Thank you for your comments. Your anecdote of the hospital consultant resonates! I too, know such people. In fact, not too many months ago, I was at dinner with a group of medical people – consultants and GPs – who either had a diagnosis of dyslexia themselves, or it had been applied to a member of their family. We had a very interesting discussion. The consensus was that the term had been helpful for the self-esteem of the person concerned. However, there was also agreement that it would have been a better outcome had the person actually been taught to read and spell competently. There was much wonder of ‘what might have been’ had the teaching been different. Why give someone a fish when they can be taught to fish for themselves? The post focuses primarily on reading, particularly with respect to ‘disability’ labels that are based on assumptions about mental processes. The piece also makes it clear that some people find reading more difficult than others. I’m not sure why you take the view that I am restricting SEN to physical disabilities – my references to autism and Down Syndrome, for example, make it clear that disabilities can affect mind and body. I do make the argument that, with effective teaching, at the earliest stage possible, additional time and supports can become unnecessary. There are many ‘diagnoses’ that have no utility, as they do not provide any additional information that will improve the teaching required to address the issue (see Julian Elliott’s work). Unfortunately, in my own experience, I have encountered too many instances of teachers of SEN who have had little or no ambition for their students but were wedded to labels and saw their role as advocating on behalf of the child, by explaining to teachers why the student couldn’t do something. The expectations were so low but, when these students were taught to read, their confidence and self-esteem grew, they were able to access the curriculum independently and they learned that they could be good at learning. I wish I had a pound for every time I have been told “good luck with such-and-such – they have , everything goes in one ear and out the other / can’t concentrate etc etc.” NB This is in no way an aspersion on all SEN teachers – I have also seen some outstanding practice!